Mix together, then apply directly to sticker residue, random goo, gum, crayon marks, etc. (Test in an inconspicuous place first, if needed) Rub in with your fingers, then wipe away with a clean rag. Repeat as needed. Combine in a 8 oz spray bottle, shake to combine. Spray throughout the house to eliminate odors or stale smells. Posted on April 4, 2017 by kim falls and filed under You asked us and tagged Aromatherapy & Massage Household Cleaning. With Spring officially here, it's time to put a little elbow grease into your cleaning routine. Maybe this is when you clean window frames or base boards but if you're looking to use more natural cleaning products or to make your own, look no further! We carry Many natural cleaning products from Nature Clean as well as other Ecover, Seventh Generation and more. Most are unscented which is great for those with sensitive skin. 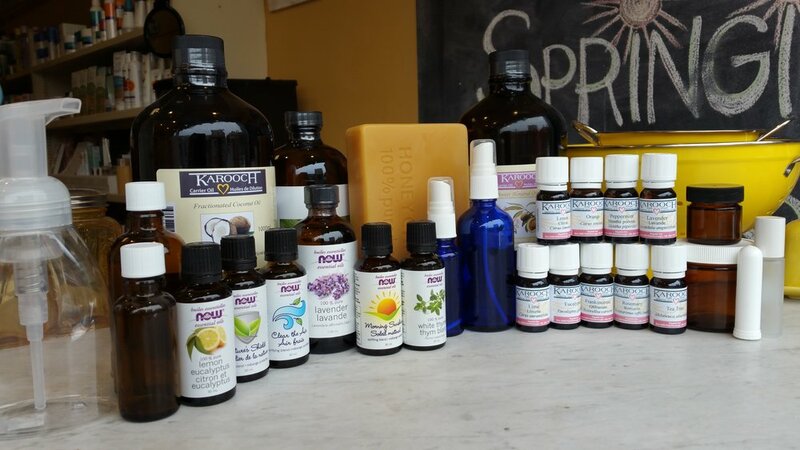 If you're thinking of making your own products we carry lots of ingredients from natural bleach (hydrogen peroxide) to apple cider vinegar to borax and many essential oils. We also have bottles and containers for your creations! Come in and check us out today and look up recipes for DIY cleaning products in our scrapbook section or by searching. Posted on April 4, 2017 by kim falls and filed under Feature of the month and tagged Household Cleaning Laundry Dishwashing. Want to make your own natural disinfectant spray at home? Here are a few great recipes using thyme oil, which is an excellent germ killer! Allow this blend to mellow for an hour and always shake before using. Mix well and shake before using. Posted on February 22, 2017 by kim falls and filed under Helpful Hints and tagged Aromatherapy & Massage Household Cleaning. Is there a natural recipe for cleaning silver? Posted on December 15, 2015 by kim falls and filed under Helpful Hints, You asked us and tagged Household Cleaning. What's the dealio with "Armenian Paper"? Posted on August 26, 2015 by Marcia Dye and filed under You asked us and tagged Household Cleaning.